Gallagher brothers, Noel and Liam, are reportedly in top-secret talks about re-forming Oasis. Noel and Liam Gallagher have been approached by promoters willing to pay huge sums for them to play two shows to mark 20 years since their debut album. And their answer could match the album’s title: Definitely Maybe. Noel and Liam Gallagher could be tempted, despite Noel once saying the band wouldn’t re-form “even if all the starving children in the world depended on it”. Talks are said to be fragile but the package on the table may prove irresistible to Liam Gallagher. Liam Gallagher, 40, needs to pay for £500-an-hour lawyer Fiona Shackleton, who is handling his divorce from Nicole Appleton. Oasis split in 2009 after fighting between the brothers. Since then Liam Gallagher’s new band, Beady Eye, have had only a fraction of the success of Oasis. If the concerts do go ahead, they are expected to be staged next August at Knebworth. 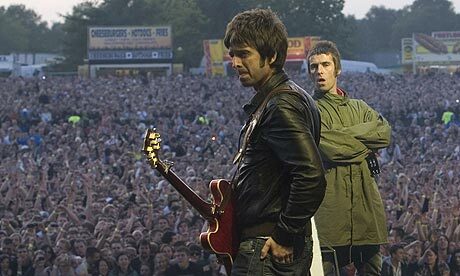 When Oasis played there in 1996 they sold 330,000 tickets – the fastest-selling in British rock history. Liam and Noel Gallagher have not been on stage together since a dramatic showdown at a Paris gig in 2009 when Liam reportedly smashed one of Noel’s guitars. He has since fronted his band High Flying Birds. But in June, Liam Gallagher hinted there could be a reunion.